Having already broken the world transfer record this summer with the acquisition of Neymar from Barcelona, Paris Saint-Germain remain in the hunt for Monaco’s Kylian Mbappe. The latest report from Sky Sports suggests the Ligue 1 outfit are in talks to take the French striker on loan initially with an agreement to buy him next summer. That deal would also involve Brazilian winger Lucas Moura heading in the opposite direction. A couple of this window’s other drawn-out transfer sagas could well end with the players remaining at their clubs as it is believed that Barcelona may have given up on their attempts to sign Liverpool star Phillippe Coutinho. Similarly, the Reds appear to be getting nowhere with their attempts to bring in Virgil van Dijk from Southampton ahead of the 31 August deadline. Elsewhere, a number of clubs including Chelsea have been alerted by suggestions that Juventus could be open to letting Italian midfielder Claudio Marchisio leave in this window. Gazzetta dello Sport claims the Champions League finalists may accept the right offer for the 31-year-old. Meanwhile, AC Milan have announced a deal for Fiorentina striker Nikola Kalinic, who joins on loan with an obligation to a permanent deal. In some Irish-related news, League One club Plymouth Argyle are closing in on a loan move for Preston North End striker Eoin Doyle. As one of Ron Atkinson’s first signings, Steve Staunton arrived at Aston Villa from Liverpool for £1.1 million n the summer of 1991. The Louth man had won the old First Division — the club’s last top flight title — and the FA Cup during five years with the Merseysiders. He would go on to make 263 appearances for Villa before returning to Liverpool in 1998. However, Stan rejoined the Midlands club for a second spell two years later — this time arriving on a free transfer. One of Ireland’s finest servants with 102 caps, he was comfortable playing in a number of positions across the back and in midfield. Email “Mbappe to PSG on loan initially with Lucas Moura part of the deal and today's transfers gossip ”. 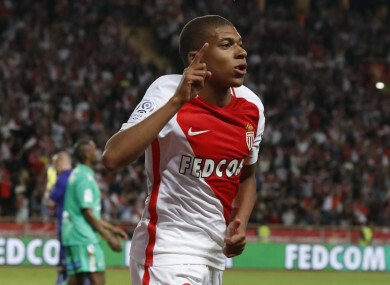 Feedback on “Mbappe to PSG on loan initially with Lucas Moura part of the deal and today's transfers gossip ”.